• Research shows 1 out of 10 women in India suffer from Polycystic Ovary Syndrome. 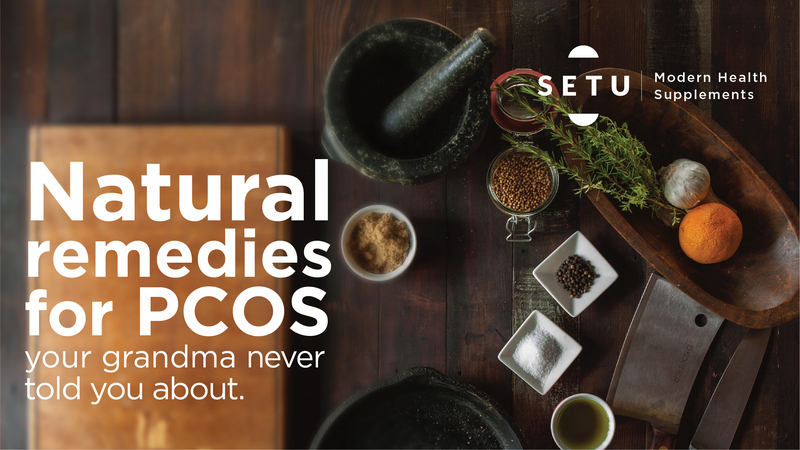 • Whilst there is no cure for PCOS, this entry focuses on the benefits of natural Indian remedies to regulate and reduce the symptoms. First, let me tell you a little bit about PCOS. It is a hormonal imbalance problem most commonly found in women, due to cysts that form in their ovaries. The bad news? They have still not found the cure and the long-term problems vary from infertility to cardiovascular diseases. The good news? There are many ways to regulate and reduce the symptoms to prevent these long-term issues. Also, if it helps, you are not alone as it is a modern lifestyle related issue. 1 in 10 women in India suffer from PCOS. First off, the most important thing to do is to clean up your diet and improve your lifestyle by working out regularly. I know, you have heard this before and it is hard, especially when those samosa cravings come in at 5pm. But hey, you gotta do what you gotta do and fortunately, by just doing these two things, you are already on your way to reducing the symptoms considerably. Next thing to do is to focus on supplements. No, I am not talking about having birth control pills. I am talking about Indian supplements. We love using turmeric and dahi masks on our faces, or any sort of home remedies because that is what our grandmother’s have taught us. And, let’s face it; it doesn’t get any better than that so why not invest in Indian herbs that can help us? Shatavari (Asparagus racemosus): The word ‘shatavari’ means ‘a woman with thousand husbands’. It is an adaptogenic herb that is considered an important staple supplement for women. It has antioxidant, anti-inflammatory and anti-diabetic properties and protects the female reproductive system. Haridra (Curcuma longa): Turmeric is known as the “friend of women.” Its benefits are endless. It improves complexion, acts as a natural detoxifier, reduces acne, helps in weight loss, and improves insulin resistance. Bibhitaki (Terminalia belerica): also known as Baheda. This herb focuses on improving hair quality and promoting hair growth and helps with digestion. It also has a mild laxative quality and helps in blood detoxification. Guduchi (Tinospora cordifolia): This powerful herb has antioxidant properties, boosts immunity, helps ward off allergies and has anti-carcinogenic properties. It is also said to aid in reducing symptoms of diabetes. Ashoka (Saraca indica): this herb has cooling properties, stabilizes circulation and relieves pain and is commonly used in females to regularize hormones and menstrual cycles. Other benefits include digestive and diuretic properties. All of the herbs mentioned above are available in 3 different forms: powder, pill or as a liquid extract. Choose as per your preference. Start with ¼ or ½ tablespoon dosage mixed with water if in the powder format, as soon as you wake up. In case you are wondering, both Himalaya and Patanjali stock these herbs and they are readily available in any Ayurvedic store, as they are plants that are commonly found in India. Of course, it all depends on what suits you and your needs. So do your research, invest in supplements that improve your wellbeing and I am sure you will feel the difference. Here is to controlling, if not beating, PCOS!